Warnings: this review is mostly spoiler free. The Nun is rated R16 in New Zealand. It contains horror and images of suicide. 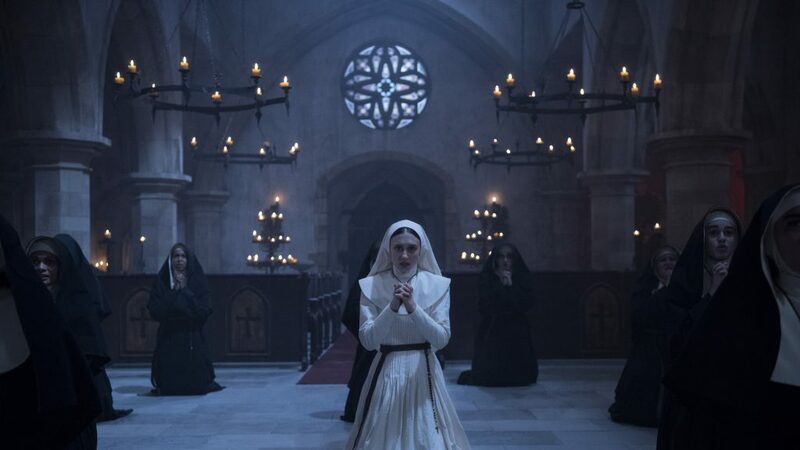 If you’re a fan or you’ve kept up with The Conjuring series and its various sequels and spin-offs, you’re probably eagerly anticipating The Nun, which is boasted to be the ‘darkest chapter’ of The Conjuring universe. Going by first impressions, it would have seemed so. The concept art was some of the most terrifying I’ve ever seen, its effectiveness fuelled by the sneak peaks we’ve had of The Nun in The Conjuring 2. All the little flashes and snippets we’ve seen of this less than holy nun all lead up to this film – we finally get to know its origins, and why such an evil force takes the form of something we would never normally find scary. Set in the 1950s, a castle-turned-convent deep in the isolated woods of a Romanian village makes for a prime backdrop to this potentially thrilling premise. The film starts off with fists swinging already – in the opening moments of the film, we see a nun take her own life by wrapping a noose around her neck and jumping from what seems like a third-storey window. This is what sets off the chain of events that eventually explore how the demonic nun came to be. 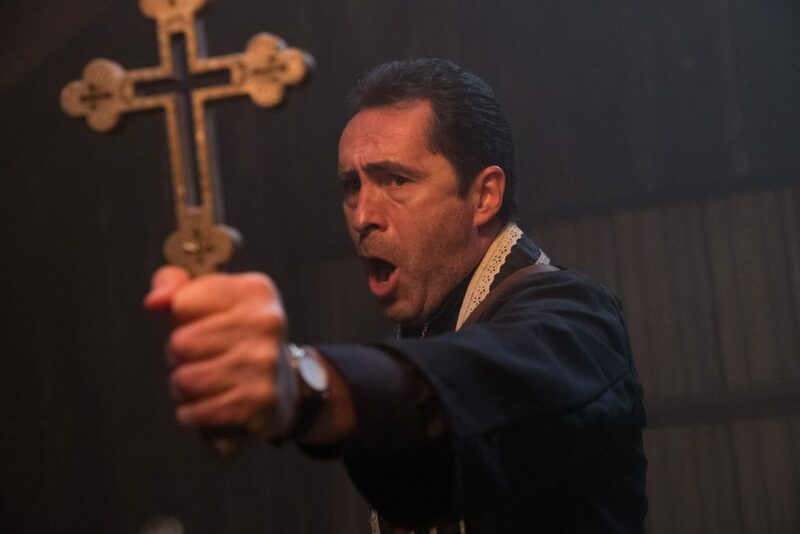 Sister Irene (Taissa Farmiga) and Father Burke (Demian Bichir) investigate the unusual and strange circumstances around the nun’s unfortunate demise, with the help of Frenchie (Jonas Bloquet), the token innocent bystander who was just dragged into this. To be honest, after having watched the other movies in the franchise, I was expecting to be scared out of my wits watching The Nun, and I was low-key excited about it. However, the numerous cliched jump scares got old and predictable pretty darned fast, and soon I was playing an internal game of horror movie bingo in my head – the scene is quiet but as soon as the character turns around, the dreaded form is there? Yep, cross that out. Three or more times. The Nun wasn’t all hollow, though. The costuming and set design were pretty cool – an actual castle with some ~spooky~ history was utilised, and this made for a beautifully gothic set. And the film itself was quite entertaining, if you watch it with others. Feeling your own heart race in anticipation and hearing others gasp and titter nervously in the theatre was quite a fun experience itself. Although the film itself was filled with religious imagery (uh duh), I felt like the ins and outs of Catholicism and its relation to demonology could have been explored in more depth. This, plus a longer run-time, would have probably made for a more satisfying viewing experience. I was looking forward to digging my nails into the armrests of the seat, to hugging my knees to my chest and to partially watch the film through my fingers, but I ended up getting more scared of my car being locked in the garage as I watched the clock on my phone tick closer to midnight. Thank you to Roadshow and Warner Brothers for hosting us at The Nun preview screening! The reception itself was a wild ride, so they get an A+ on that aspect. The Nun is showing in New Zealand cinemas from September 6.